Place water and butter into a 2-quart sauce pan and bring to a boil over medium-high heat. Stir in flour and salt all at once; beat with a wooden spoon until mixture pulls away from the sides of the pan. Continue to cook for one minute over medium high heat. Remove from heat and cool for 5 minutes. Beat in eggs, one at a time, making sure that each egg is incorporated before adding the next. Beat until dough is smooth and shiny. Drop dough by tablespoonfuls onto ungreased baking sheets. Bake in 400°F oven for 15 minutes; reduce heat to 350°F and bake for an additional 10 minutes, or until puffs are golden. Cool on wire rack. Split each puff and remove any uncooked dough. Fill with Whipped Cream Filling; dust with powdered sugar if desired. Makes 20 cream-puff shells. Whip 2 cups Darigold heavy cream into soft peaks. Add 3 to 4 tablespoons of powdered sugar and 1 teaspoon vanilla extract. Beat cream mixture until stiff peaks form (about 1 minute). 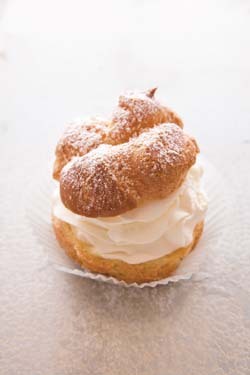 Spoon or pipe cream into prepared cream puffs.